Reed's Fine Furniture has been selling quality, upper end furniture since 1990. 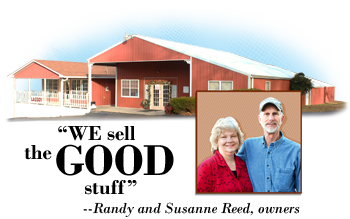 We service Benton, Henry, Humphreys and surrounding West Tennessee counties, offering a better grade of furniture. We buy American made furniture whenever possible and sell a lot of solid wood, as well as some Amish oak and cherry to give our buyers a beautiful and durable product. Our recliners are LA-Z-Boy brand along with reclining sofas. The Livingston brand of sofas feature 8-way tied supports under the cushions, are custom built and custom ordered at Reeds. Dutchcraft Bedding offers a full line of all-foam beds, as well as reversible innerspring mattresses. We have a large selection of bedroom suites by Vaughn Bassett and Carolina Furniture. We offer free delivery and service what we sell. We hope this introduces you in a general way to Reed's family-owned furniture store where "we sell the good stuff!" CLICK HERE to view our recent commercials. We welcome after-hours appointments, just call us!